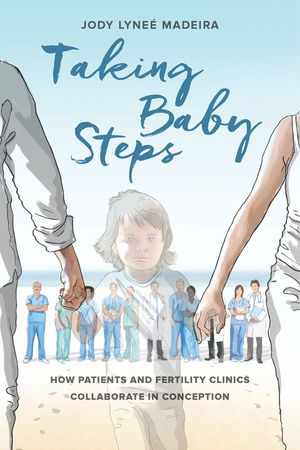 In Taking Baby Steps, Jody Lyneé Madeira takes readers inside the infertility experience, from dealing with infertility-related emotions to forming treatment relationships with medical professionals and confronting difficult medical decisions. Based on hundreds of interviews, this book investigates how women, men, and medical professionals negotiate infertility’s rocky terrain to create life and build families—a journey across personal, medical, legal, and ethical minefields that can test mental and physical health, friendships and marriages, spirituality, and financial security. Jody Lyneé Madeira is Professor of Law at the Maurer School of Law, Indiana University–Bloomington, and the author of Killing McVeigh: The Death Penalty and the Myth of Closure. "Jody Lyneé Madeira’s interviews capture the voices of fertility patients as they struggle with decisions about whether to keep trying after repeated failures, how many embryos to implant at a time, and whether to experiment with potentially risky procedures. This volume will provide guidance (and perhaps some solace) for those undergoing fertility treatment and their friends and relatives. It also adds new depth to our understanding of the concept of 'informed consent' and of the human capacity for decision-making in the face of often heartbreaking challenges." "Taking Baby Steps turns the experience of infertility inside out, portraying the rigors and uncertainties of 'fertility math' from the perspective of those who use technology to have children and the doctors who treat them. Madeira challenges the stereotype of the 'desperate infertile woman,' a contemporary offshoot of older notions of women as hysterical, and replaces it with a carefully considered, nuanced portrait of how emotions matter for the many difficult decisions fertility patients must make. This beautifully written, deeply researched book not only enhances our understanding of how infertility feels but also provides a much-needed corrective to our impoverished notions of informed consent." "Taking Baby Steps is a wonderful accomplishment. Beautifully written, it takes the reader through the personal, social, and legal chronologies of conception through IVF. Madeira weaves together three areas of law—reproduction, emotion, and contracts—to present a complex picture of the experience of infertility and its treatment. In this way, the book offers readers a respectful intimacy with its subjects alongside an insightful account of the role of law and of technology. While we often think of conception as a sexual collaboration between partners, Madeira introduces us to the notion of collaboration between patients and physicians. Her exploration of informed consent would enrich any torts or contracts class, though this is not a typical law school text. In reading women’s accounts about IVF, I didn’t just feel that I was hearing women’s voices; I felt like I knew the women themselves. Taking Baby Steps makes a massive contribution to the field of reproductive rights and practices." 7. Is Informed Consent in Reproductive Medicine in Critical Condition?